Explanation: Soon it will be winter in Saturn's northern hemisphere. 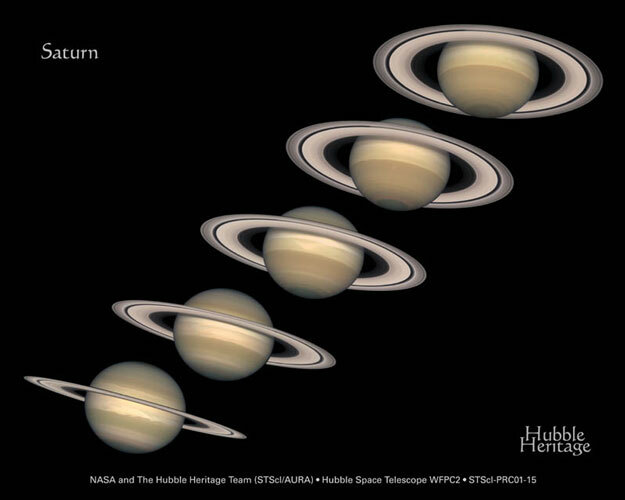 Since Saturn is tilted in its orbit around the Sun, it has seasons just like the Earth. When a hemisphere is tilted so that the Sun passes more directly overhead, summer occurs. Half an orbit later -- about 15 (Earth) years for Saturn -- winter occurs. Since the rings of Saturn orbit the equator, they provide a quite graphic seasonal display. The Hubble Space Telescope took the above sequence of images about a year apart, starting on the lower left in 1996. Saturn's rings are less than 50 meters thick and are composed of pebble and boulder sized chunks of dusty water ice.